And here it is, after almost a month sitting at 70% completed (reason: I didn't feel like doing it! ), the continuation from Part 1. Araki talks about his inspirations and methodology. Please note that there are references to other titles (mostly from Jump) as well as a brief spoiler or two. Drawing styles which are so distinctive that you can look at a person from 10 meters away and go, "oh hey, he's reading that manga" are incredible: Araki managed to make his debut, but didn't feel like he had that unique style. And so from 1981 onwards he started thinking about how he could achieve that distinctive style, something that would make people think "oh, that's him!" (Showing a blank piece of paper) If you told your art teacher "this is a drawing of 'snow" he would be very upset at you, but in manga you could say this was "the flash from a nuclear bomb" or "my soul is barren" and that would fly. And here Mr. Araki drops a bomb: "there are people who get paid for stuff like this." (audience bursts into laughter) "It's amazing, really. You know, like....I guess I could get in trouble for mentioning names." (more laughter) [note: probably in reference to Shaman King, which printed a blank 2-page pullout to supposedly express an "incredible move"] "And coloring the page all black, and saying "he went to hell." Sort of like in the last few chapters of Death Note." (audience goes into hysterical laughter, applause) Mr. Araki tried to patch things up by claiming that he was joking, but could not help further mentioning how much per page said-artists were probably paid for those particular pages. He also introduced things like the smiley face and Morizo and Kiccoro (Mr. Araki thought that Akira Toriyama had designed them), and explained that he respected these types of drawings that anybody could recognize, and that it was what he aspired for. "It's incredible. It's the ultimate style." Gaugin's (wiki) art, while having depth, also did things like contain certain colors within certain areas, paint the ground pink and the trees blue etc. Araki loved Gauguin's art ever since he was a child, and has been deeply influenced by him. When Jojo became an OVA, one of the animators asked Araki "what color if Jotaro?" however Araki had no such concept. He colors everything based on calculation. For example, in Volume 54 Giorno's clothes are pink, but in Volume 63 they are blue. Also, regarding the color cover illustration, he explains that placing the color blue beside pink exudes more power. He says that he gets his inspiration from 80's art, shading techniques in Western art, classical paintings and gets inspiration for his various poses from sculptures. All of this research, blended with Araki's own personality, result in Jojo's art style. If you don't think about "where you stand," you won't have any sense of direction even after you become a mangaka, wandering from idea to idea, not knowing what you want to write about and ending up becoming one of those people who asks their editor "what should I write?" 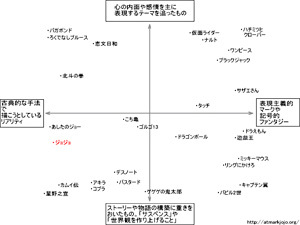 In the case of Jojo, Araki is trying to pursue reality by portraying things with classical methodology, but he gives precedence to emotion and inner thought over plot structure, trying to portray the protagonists' destiny, so he ends up in the bottom-left quadrant. Araki was fascinated by mysteries ever since he was a child, fantasized about deserted islands and believed that King Kong and Nessie existed, and so writes his manga with "mystery" as the central theme. 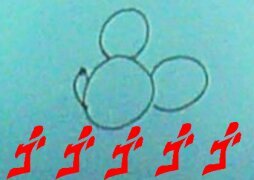 In Jojo, Araki wondered what "superpowers" really were, and if he could portray "energy" itself, which lead to Parts 1&2, and the Stands in Part 3, which were like guardians who could "destroy boulders and stuff." They would "stand" by their master and would be called "stands." Apparently Part 3 began immediately after Part 2 with no interval in between. Araki's lecture ended here and proceeded to a Q&A with students, which may or may not be posted here as Part 3. Submitted by whazzup (not verified) on Tue, 2006-07-25 10:13. Submitted by Anonymous on Thu, 2006-07-27 04:09. Submitted by Anonymous on Thu, 2006-07-27 06:04. Submitted by MangaBlog &raquo; Blog Archive &raquo; Morning news (not verified) on Thu, 2006-07-27 12:13. Submitted by Anonymous on Thu, 2006-07-27 14:25. Submitted by Neuroretardant on Fri, 2006-07-28 06:59. As I stated fairly clearly in my entry, it may or may not happen. Submitted by crinale (not verified) on Sat, 2006-07-29 19:56.
thanks for part 1 and 2, but clearly, there is a lot of demand for part 3. please continue. Submitted by Neuroretardant on Sun, 2006-07-30 02:52. As I stated fairly clearly, it has everything to do with motivation and nothing to do with demand. Submitted by house painting (not verified) on Wed, 2008-02-13 11:43. I thought I had no talent at all but after I've seen the tips I tried some sketches and I'm really proud of myself. Please, please submit part 3 as well.